The ever-humorous Derek Paterson sent me the following link. Do view and experience mirth and merriment. And remember, political correctitude doesn’t live here. Next Week: THE GATHERING DEAD Is Free! Just a little heads-up for those of you who might have put off reading The Gathering Dead. Wait no longer, because for five short days, it will be free on Amazon, starting March 25 through March 29. Already bought it? Well, I thank you for your patronage, and urge you to recommend the book to your friends. Look at it this way: the price will certainly be right,and if they hate it, they got what they paid for. Still looking to push The Farm out next week, but with tax season upon me, it might be delayed until the following week. Not to worry, though. It’ll be along quite soon! 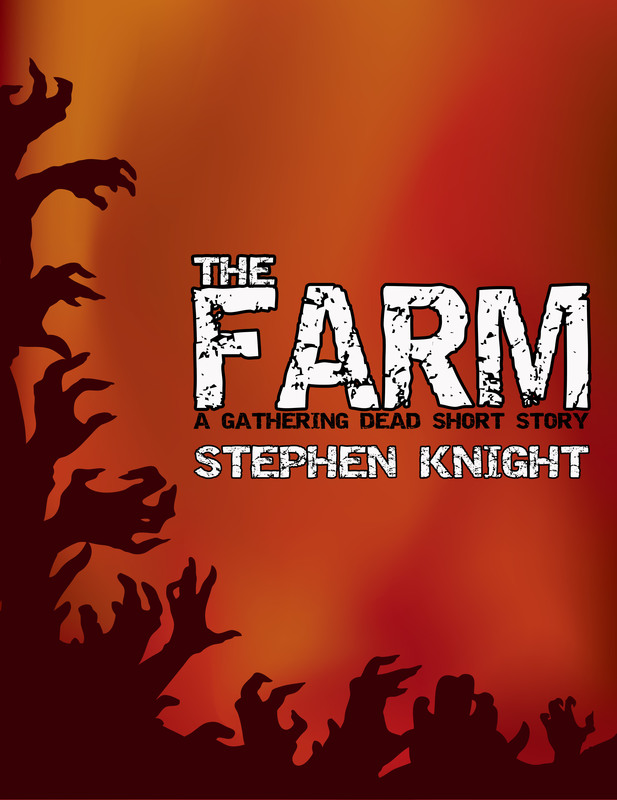 EARTHFALL Print Cover…ain’t it purty? [Knight] raises the technical and military detail in his books completely off the Michael Crichton scale and to the point of fetish, which is good for me as a reader, because I love a tense, action-packed apocalyptic story told with extreme realism. On every page, you know you are being told a story by a guy who knows his business. The all-terrain fighting machines the Harmony explorers use to cross the wastelands are virtually characters in the book, and I loved every minute of screen time they had. They’re fantastic–the ultimate ROAD WARRIOR vehicles. Knight’s attention to detail and realism also means his characters don’t do anything that has you slapping your head in disbelief. From the steady Captain Andrews to the haunted veteran Mulligan, they’re stark, likable, tough. 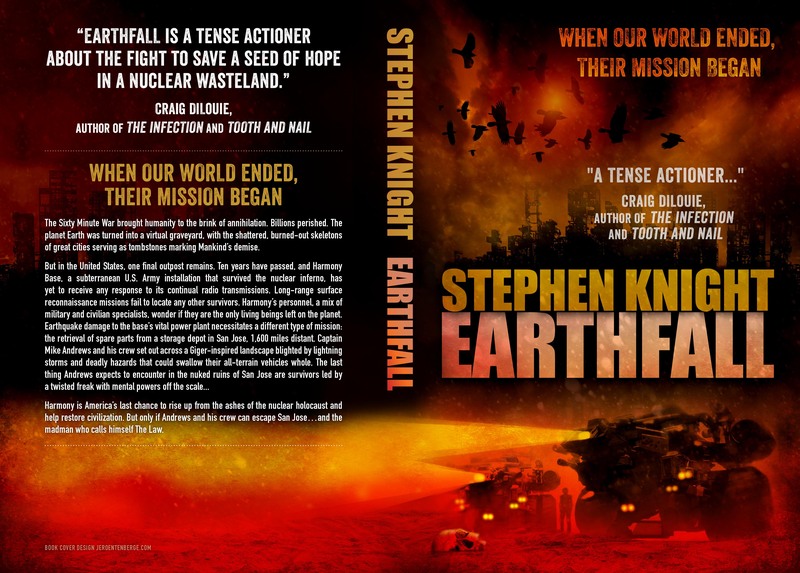 Well, it happened quicker than I’d expected, but Earthfall is now in print! Should be available in other markets fairly shortly, and I expect it to be listed on Amazon with the Kindle title shortly. The talented and just plain old über-cool Jeroen ten Berge turned in his cover for the print edition of Earthfall yesterday, and I have to say, it’s a nice one. For those who aren’t familiar with his work, he’s probably most widely known as Blake Crouch’s artist of choice–check out his covers for Blake’s excellent novels Pines, Abandon, and Snowbound, as well as the trendsetting illustration for RUN. Some thanks to Craig DiLouie for his cover blurb, and of course, the long-suffering Derek Paterson for his work on the product description, something I’m horrible at. Additional kudos to Joe LeBert, ultra-amazing author Fred Anderson, Scott Wolf, and ton of other folks. And, oh yeah…thanks to those of you who bought Earthfall and actually liked it! It’s always a thrill to see a release creep up the charts, especially in a different genre. Errata: the free period for White Tiger came to a close yesterday, and the numbers were almost 3,000 downloads in the US, and a surprising 685 in the UK. While giving away books for free seems like a dumb business move, it actually translated into some great sales–5 in the US in one day, and 14 in the UK. That’s a month’s worth of sales right there, and it’s also generated a few borrows through Amazon’s Prime program, for which I’ll get a couple of bucks as well. If this trend continues, Derek and I will have the best month ever for this book. Not a tough feat, since the highest sales numbers to date have been 21 in one month. 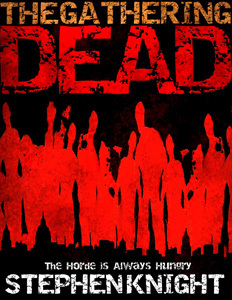 I’ve pulled The Gathering Dead from the other ebook sites and entered it into Amazon’s Prime program, as well. This gives me the opportunity to offer it for free, with the hope that it would spawn substantial sales of Left with the Dead and the two The Rising Horde books. I haven’t decided when–or even if–I’ll take this step, since The Gathering Dead is still my primary money-maker, but it is something to consider. Anyway, that’s all for now, crew. Thanks for your patronage, and I hope this weekend is full of fun and excitement for all.